I love to smell fresh peaches in the summer time. Until now, I've been quite content with just cutting them and enjoying the slices just as they are. My youngest LOVES sliced peaches. I've tried peach cobbler in various forms over the years, but none of the homemade recipes seemed good enough to motivate me to slice enough peaches all at once. There is, however, this diner in the town where I grew up that has the most wonderful peach cobbler I have ever tasted. I am not typically one to ruin my dessert with ice cream, but this stuff is so sweet that you need a scoop of vanilla to cut the sweetness. So as I looked at the bag full of peaches that I bought last week when they were on sale, it occurred to me that there must be a recipe out there that would be just as tasty as my favorite one from that diner. A call out to the world of Facebook yielded several suggestions. After perusing a couple, I ended up adapting one that my mom suggested to better suit my needs. This is the resulting recipe. Preheat oven to 400 degrees. Melt 1/2 cup butter in the bottom of an 8x8 baking dish. Wisk together flour and 1 cup sugar in a medium bowl. Stir in milk, and pour into the dish with the melted butter. Add the sliced peaches and juice on top of the flour mixture in the dish. Sprinkle 1/4 cup sugar and 1 Tbsp ground cinnamon on top of the peaches. Bake for 30 minutes. I think that this is the closest I have had to the diner version of peach cobbler. It definitely turned out to be a great recipe. I don't think it's quite as sweet (makes me wonder just how much sugar they use), and you can get by without the ice cream. 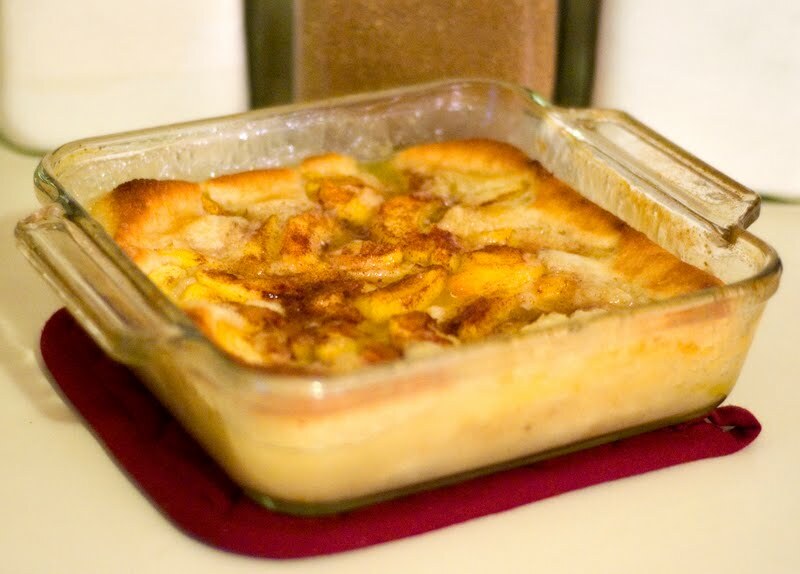 If you prefer yours that way, then you should throw a scoop of vanilla on top, and enjoy this cobbler! For more wonderful recipes visit Tasty Tuesday over at Balancing Beauty and Bedlam. Oh my!!! Could you save me a piece?! What a yummy looking cobbler!